MACKINTOSH OF MACKINTOSH, ANGUS, 26th Chief of Clan CHATTAN and 25th Chief of Clan MACKINTOSH, businessman, jp, militia officer, and politician; b. 1755 at Castle Leathers, near Inverness, Scotland, son of Duncan Mackintosh of Castle Leathers and Agnes Dallas of Cantray; m. 17 June 1783, in Detroit, Mary Archange Baudry, dit Desbuttes, dit Saint-Martin, and they had 14 children; d. 25 Jan. 1833 at Daviot House, near Inverness. Angus Mackintosh arrived in Detroit during the American revolution and in 1779 was a partner in Forsith, Dye, and Mackintosh. Unfortunately, his arrival coincided with the beginning of a severe downturn in the fur trade. This decline caused bitter competition within local commercial circles and in 1786, as a matter of survival, a number of prominent merchants including Mackintosh decided to cooperate in the formation of the Miamis Company [see John Askin*]. The project was abandoned after a few years, however, as unprofitable. Mackintosh therefore turned to other activities to supplement his income. 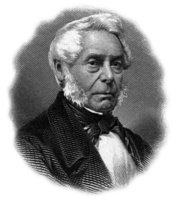 He became the North West Company’s agent, first in Detroit and later at Sandwich (Windsor). In this capacity he assumed responsibility for its merchandise and pelts, and purchased provisions from local farmers. He continued to operate as an independent fur trader, maintaining his own engages in the area southwest of Lake Erie. Like Askin, Mackintosh was chronically indebted to his Montreal suppliers. Shortly after the British evacuated Detroit in 1796, he purchased land on the south bank of the Detroit River. Here he built a small complex consisting of a store, wharf, and storehouse and a rambling frame residence, Moy House, which the family had moved into by 1799. Located just east of Sandwich, Moy was the centre of his commercial activities for the next three decades. As a merchant Mackintosh was vitally interested in shipping and several ships were built at Moy. It also became the home port for other vessels, such as the famous schooner Nancy [see Miller Worsley]. Mackintosh speculated in land as well. He held extensive property in Detroit and Sandwich, on the Rouge and Raisin rivers in Michigan, in the Toledo and Sandusky areas of Ohio, and in Harwich Township of the Western District. Acutely aware of the advantages of political connections, Mackintosh was one of the local merchants who supported the early political fortunes of David William Smith*, and Smith’s subsequent appointment to the post of surveyor general permitted Mackintosh in turn to assist his business friends in their land acquisitions. Occasionally, Mackintosh also sought help in land matters from his cousin Æneas Shaw*, an executive councillor. In 1810 Mackintosh was appointed a justice of the peace. Five years later he became the paymaster to the 2nd Essex Militia. In 1820 he entered the Legislative Council. He was present during the debate over support for the Welland Canal Company and, as might be expected, supported its construction. Later, however, when the project encountered difficulties requiring repeated infusions of public monies, Mackintosh became disillusioned, doubting whether the canal would ever become operational [see William Hamilton Merritt*]. He experienced a deep personal loss on 10 July 1827 when his wife died. He left Moy the same year to return to Scotland, where he succeeded his late brother as the chief of Clan Mackintosh. He lived at Daviot House rather than Moy Hall, the traditional seat of the clan chieftains. After his death he was succeeded by his third son, who moved into Moy Hall in 1835. Angus Mackintosh was a typical merchant of the period, whose activities, although impressive and diversified, were modest compared to those of Askin, Alexander Grant*, or William Robertson*. None the less, he was among that small group of entrepreneurs who left Detroit and contributed to the early commercial development of the Sandwich area and the Western District. AO, Hiram Walker Hist. Museum coll., 20-135, 20-138. Court of the Lord Lyon (Edinburgh), Public reg. of all arms and bearings in Scotland, 36: f.40. DPL, Burton Hist. Coll., Burton file E and M/929.2, Mackintosh family; Alexander Mackintosh papers, log-book of the schooner Nancy, 1813–14 (typescript); Mackintosh family papers. PAC, MG 19, A31. Gentleman’s Magazine, January–June 1833: 478. Windsor border region (Lajeunesse). Scotsman (Edinburgh), 9 Feb. 1833. M. [E. Darroch] Mackintosh of Mackintosh, The Clan Mackintosh and the Clan Chattan, revised by Lachlan Mackintosh of Mackintosh (new ed., Loanhead, Scot., 1982), 60, 78. Christian Denissen. Genealogy of the French families of the Detroit River region, 1701-1911, ed. H. F. Powell (2v., Detroit, 1976), 2: 1072-73. D. R. Farrell, “Detroit, 1783-1796: the last stages of the British fur trade in the old northwest” (phd thesis, Univ. of Western Ont., London, 1968). W. E. Stevens, “The northwest fur trade, 1763–1800,” Univ. of Ill. Studies in the Social Sciences (Urbana), 14 (1926), no.3. R. G. Hoskins, “MACKINTOSH OF MACKINTOSH, ANGUS, 26th Chief of Clan CHATTAN and 25th Chief of Clan MACKINTOSH,” in Dictionary of Canadian Biography, vol. 6, University of Toronto/Université Laval, 2003–, accessed April 20, 2019, http://www.biographi.ca/en/bio/mackintosh_of_mackintosh_angus_6E.html.